I've been a busy little bee here at the farm. Just sent off my next batch of work for my next book. Lots of new and upcoming things happening here and there that I can't wait to share with all of you. If you want to be first to know what they are, sign up for my "Once in a While Newsletter" up on the top of the right sidebar. 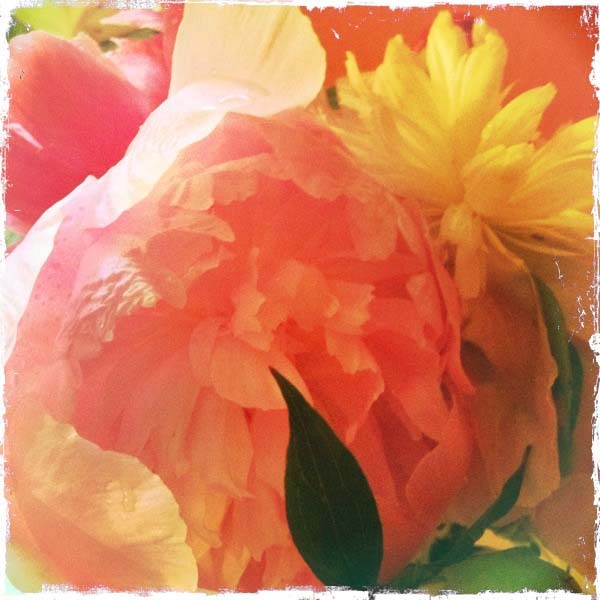 There is just something so joyful and boisterous about peonies, isn't there? All the flouncy petals welcoming in summer. 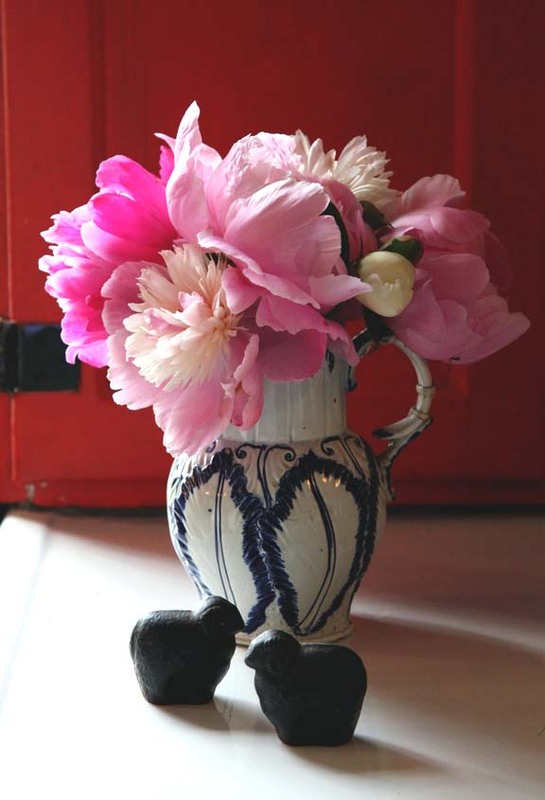 I have finally tossed the last peonies from the jugs and vases in the kitchen. Such a sad day to have to wait a whole year for the next batch of blooms. I love having fresh flowers from my garden or from the neighboring fields in my kitchen. At this time of year, most of the flowers are pastel shades and whites. I've been taking lots of photos of them. I use a 50 mm lense on my DSLR. which allows for that lovely unfocused fadeout of certain areas of photos. I've learned the term for the unfocused area is called "bokeh." 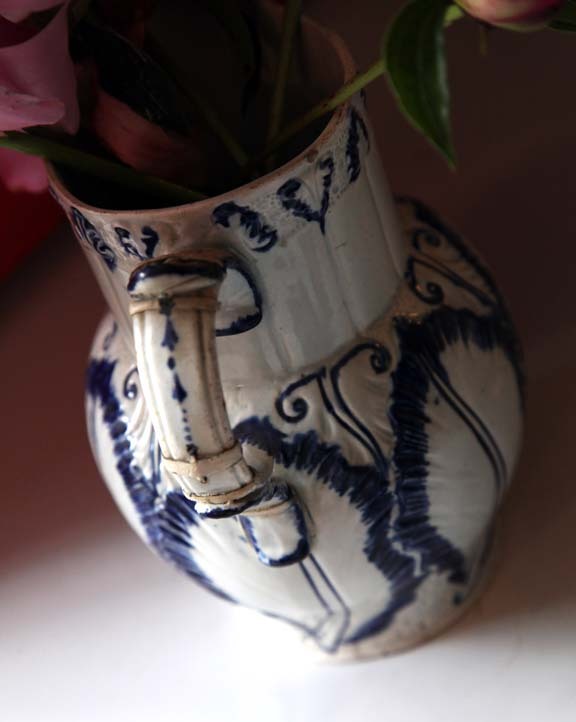 I love the old blue and white vase the peonies are in. I bought it several years ago at an antique store in England. My favorite thing about it, besides the color and the shape is the oddly patched handle. The handle must have broken at some point and it was patched with some small pieces of metal almost resembling staples. 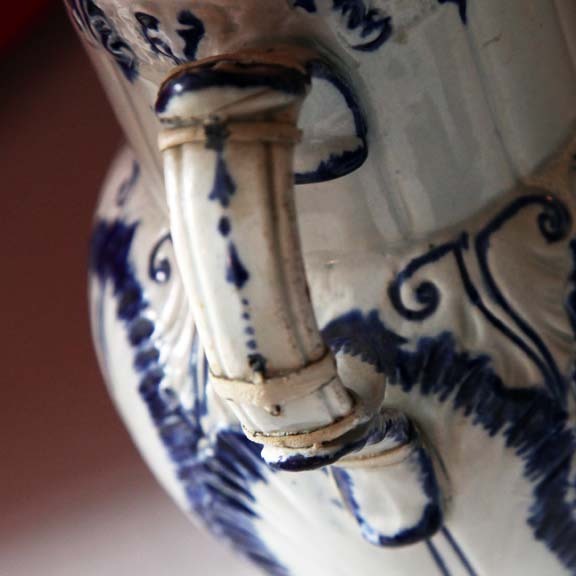 I know nothing about the jug, just that I like it and the age and the character it has. When I first started trying to work in oil paints, I painted the jug with a small handful of flowers in it. I must try to paint it again someday. For all you iPhone users, I've found an interesting new camera app called Camera+. It is 99 cents and there are lots of nice features that can make your photos better. And it's not all about filters like Instagram or Hipstamatic. Check it out here. I think peonies (and lilacs) belong in blue & white vases. I have some sitting on my kitchen windowsill right now! Love that vase. Whatever. IT's still a pretty Piece! And, the flowers look great too! BTW, I love your Instagram shot! IT makes me just want to paint OR, needlepoint IT! Another book? Can't wait to get my eyes on it! You are a work horse of productivity. Don't know how you do it all. Painting too?!!! You are so multitalented. Really looking forward to the new book. I like you oil painting! 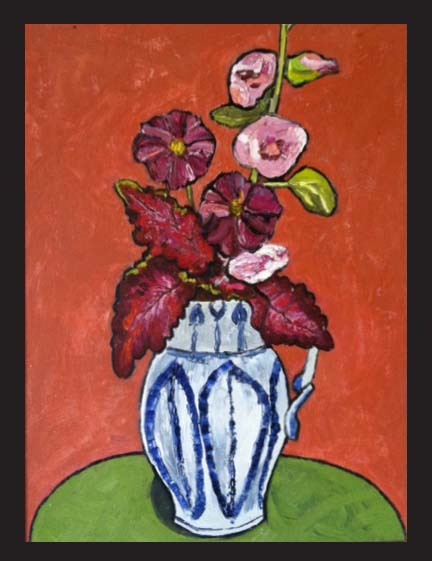 Beautiful flower shares - including the painting you did!